Double arm automatic rewind hose reels for air, water. All metal construction with forged brass shaft for corrosion free and leak proof operation even at high pressure. 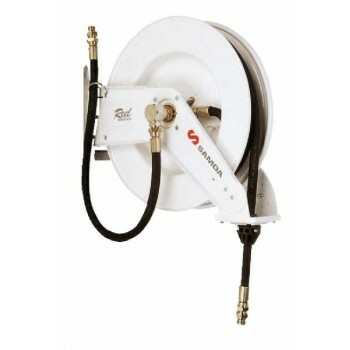 Hose recoiling is driven by a special steel spring, which provides a long life and trouble free operation. Positionable arms for optimum operation in any mounting position: wall, ceiling, floor or tank. Maximum hose capacity: 10 m x 1/2” hose. Models with hose include a 0.8 m long inlet hose.